Sadly, we have heard that Connie Dreyer, owner and partner of Halynov’s Moondoggie, has passed on “ She lived for her horses, and Moondoggie was her star. We first met Connie when she applied for a job as our receptionist for our Workers Comp vocational rehabilitation firm. 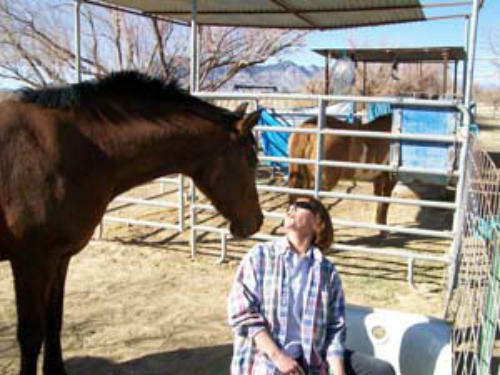 We quickly realized that her major talent was her rapport with our horses. 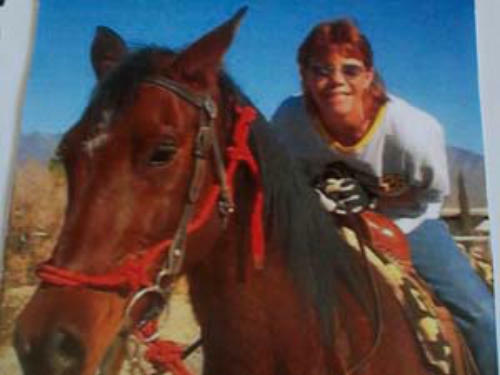 She became part-time receptionist and part-time horse handler. 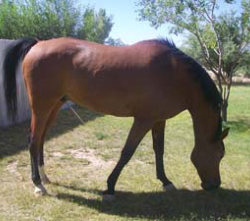 We gave her a rescue horse who later freaked out during a lightning storm and ran through some neighbor’s barbed wire. Connie painstakingly and lovingly dressed the wounds and brought Hallucination back to full health with minimal scarring. 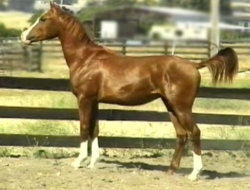 We gave Connie Moondoggie as a young colt. When Connie relocated to another area, she kept us apprised of Moondoggy’s training progress. This is one of her early posts: “ Moon is probably the most magnificent horse I have ever had in my life. He can and will do anything you ask of him from Jumping to cutting, he has really come a long way. His trainers Patrick and Wendy love him to death. He is so intelligent, and demands your attention with just his presence. First time I took him to a team penning just for fun they about laughed me out of the arena, because he was an Arabian and had no business working cattle. Well I don't have to tell you he blew them out of the water, and not one snicker did I hear the rest of the day. Wendy rides him English and his extension is outstanding. Thank you for such a wonderous gift as Moondoggie, he means so much in my life, and my granddaughters. I am glad to know you all are still around and doing well.” And then a later email: Thought you would like to know Moondoggie is doing quite well. He has become quite a showman, and of course hams it up. He has quite a following and most everyone who meets him is in awe of his beauty and graceful movement. Some are intimidated at the size of him. I thank you so much for allowing him to become such a beloved part of our family. and again: “Since it has gotten so hot (I hate the desert in Summer) we have been riding at night. We were at the arena the other night and I got some beautiful pictures there. We trailer down about 8PM and ride till midnight or after, I do like to ride at night. Plus I have some real nice pictures of him in the snow this Winter... I love riding him, when I take him out of the trailer people are just in awe of him. Then they see him move and can't say enough of his beauty and grace. But he is a clown, and does like to play. There are times I have to take him aside and tell him to behave, he just thinks he's one of the kids. Because of his size 16.2 some are very intimidated by him, but his gait is phenomenal, he is a gentle giant. I have to thank you for allowing him to be a very important member of the family.” Connie was killed in an auto accident in December 2010. We will surely miss her and her wonderful updates. We understand that Moon is now with her sister in Washington. Our love to them both and to Connie’s whole family. Sadly, we have heard that Connie Dreyer, owner and partner of Halynov’s Moondoggie, has passed on “ She lived for her horses, and Moondoggie was her star. We first met Connie when she applied for a job as our receptionist for our Workers Comp vocational rehabilitation firm. We quickly realized that her major talent was her rapport with our horses. 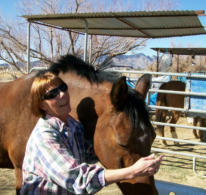 She became part-time receptionist and part-time horse handler. We gave her a rescue horse who later freaked out during a lightning storm and ran through some neighbor’s barbed wire. Connie painstakingly and lovingly dressed the wounds and brought Hallucination back to full health with minimal scarring. 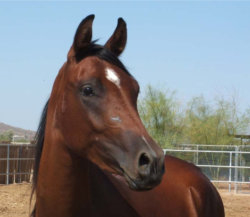 We gave Connie Moondoggie as a young colt. 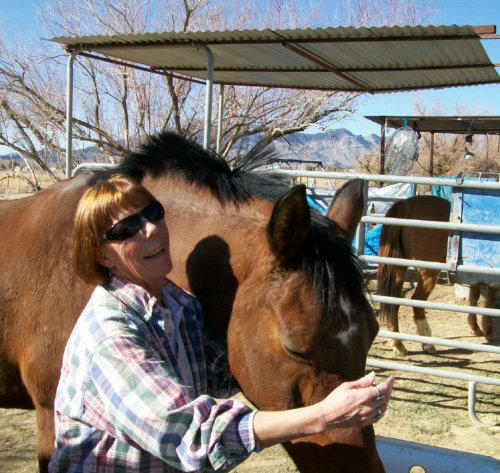 When Connie relocated to another area, she kept us apprised of Moondoggy’s training progress. This is one of her early posts: “Moon is probably the most magnificent horse I have ever had in my life. He can and will do anything you ask of him from Jumping to cutting, he has really come a long way. His trainers Patrick and Wendy love him to death. He is so intelligent, and demands your attention with just his presence. First time I took him to a team penning just for fun they about laughed me out of the arena, because he was an Arabian and had no business working cattle. Well I don't have to tell you he blew them out of the water, and not one snicker did I hear the rest of the day. Wendy rides him English and his extension is outstanding. Thank you for such a wonderous gift as Moondoggie, he means so much in my life, and my granddaughters. I am glad to know you all are still around and doing well.” And then a later email: Thought you would like to know Moondoggie is doing quite well. He has become quite a showman, and of course hams it up. He has quite a following and most everyone who meets him is in awe of his beauty and graceful movement. Some are intimidated at the size of him. I thank you so much for allowing him to become such a beloved part of our family. and again: “Since it has gotten so hot (I hate the desert in Summer) we have been riding at night. We were at the arena the other night and I got some beautiful pictures there. We trailer down about 8PM and ride till midnight or after, I do like to ride at night. Plus I have some real nice pictures of him in the snow this Winter... I love riding him, when I take him out of the trailer people are just in awe of him. Then they see him move and can't say enough of his beauty and grace. But he is a clown, and does like to play. There are times I have to take him aside and tell him to behave, he just thinks he's one of the kids. Because of his size 16.2 some are very intimidated by him, but his gait is phenomenal, he is a gentle giant. I have to thank you for allowing him to be a very important member of the family.” Connie was killed in an auto accident in December 2010. We will surely miss her and her wonderful updates. We understand that Moon is now with her sister in Washington. Our love to them both and to Connie’s whole family.